We’d love your help. Let us know what’s wrong with this preview of Killing the Murnion Dogs by Joe Wilkins. In five dream cycles, Killing the Murnion Dogs investigates place, memory, and ruin. Though there are no answers here, the poems themselves become a kind of testament, small acts of creation and re-creation that afford a weary, hard-won hope. To ask other readers questions about Killing the Murnion Dogs, please sign up. This is a superb collection of honest, earthy, authentic poems. Whether evoking a classroom in the Mississippi delta, a liquor store in Memphis, or a drought in eastern Montana where he was born and raised, Joe Wilkins understands how landscapes shape and mold hearts and minds. The title poem is a wonder: the tenderness in the midst of the carnage is deeply humane. 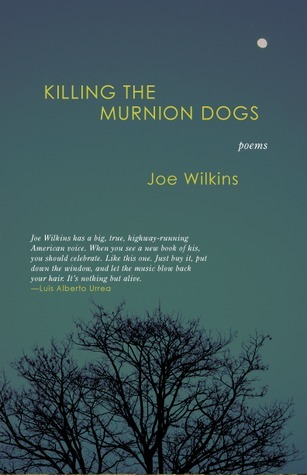 Joe Wilkins may be presenting his first collection of published poetry with KILLING THE MURMION DOGS, but his voice is so sure, so informed, so able to dodge the detritus of gimmickry to convey his thoughts that he feels like an old soul, a poet who has been whispering to us for years and we just haven't noticed. In this is powerful work we encounter a man who faces life straight on, taking into account every feather and clod that build his atmospheric investigations of the little moments in life that carry big meanings. But it takes spending time reading his poems to absorb the unique flavor of Joe Wilkins' views. In HE IS ONLY SIX AND HAS NOT YET SEEN ANYONE HE LOVES DIE he writes: The stars snap open like wet mouths,/ and the boy drapes a flannel jacket/ across his father's shoulders and sits beside him/ on a three-legged camp stool/ and rocks in slow circles; he hears/ the wooden knock of each leg on the earth/ and cries of coyotes like laughter,/ like little girls. Yet his father calls the coyotes `Old dogs',/ so when the boy hears it, a dark bell/ of howl rung and rung, he just thinks/ `It must be the oldest dog',/ but then he sees his father has craned forward,/ his flannel and tin cup of whiskey forgotten,/ his mouth slow and open, and the boy/ watches his father lip the word, `Wolf'. Past injuries, even if they are now gone bruises, surface in Wilkins special voice and he gives us permission to recall the things in our past that kept us together despite the pangs we have thought to recall as regret. Life in Joe Wilkins' words goes on and the dust that has covered the surface of our past - it can be blown off memories and simply become part of them. I had the privilege of meeting Joe in Jackson and even attending a seminar with him. I love his style of writing, and even if I didn't understand the meaning of each and every poem, I found a nugget that I could relate to. I took a long time reading the book at work. I would read a poem or two most days on break. It was like having a treat and savoring it for later enjoyment. I especially appreciated wondering almost throughout the entire book what inspired the title. pg I had the privilege of meeting Joe in Jackson and even attending a seminar with him. I love his style of writing, and even if I didn't understand the meaning of each and every poem, I found a nugget that I could relate to. pg. 17, 18 "...as your days are most times hard/and wrong and wrapping your cracked/hands around a cup of milky coffee/is the best thing you know." pg. 58 "This is the dark world I can do nothing/about but settle back/into darkness I wake in the dark/and remember"
pg. 59 "...It's true she is alone..."
"...and a cool wind licked the whole length of her/and the valley." "Her heart and the world have found this usual way/ to go on." I first found Joe Wilkins in the pages of The Sun and then sought out his work, finally getting to read a whole book! where you can read 5 poems from the book as a sampler! "How to Bring Down Rain" is the pre-poem to the whole, before the italicized, unpunctuated "Dreams of Home" that divide the book into sections; as a pre-poem I first found Joe Wilkins in the pages of The Sun and then sought out his work, finally getting to read a whole book! where you can read 5 poems from the book as a sampler! "How to Bring Down Rain" is the pre-poem to the whole, before the italicized, unpunctuated "Dreams of Home" that divide the book into sections; as a pre-poem it sets us up for drought, grief, and wisdom to come. There is great variety of form in the book--the surreal dream poems, letter poems, long and short lyric poems, and even prose poems--but a strong sense of wholeness, integrity, and purpose. This book makes me sense the poet's conviction, that he takes poetry seriously as a way to say the important things of life, and I like that a lot. It inspires me. I liked Ragged Point Road much better than this book. I really cannot explain why that is as I really have no good idea myself. This book does have several poems from the chapbook, including some that I really like. But, somehow, as a whole it does not work for me as well as Ragged Point Road did. Perhaps in a year or so I will reread them and switch the order in which I read them so as to get a different perspective. I made sure to insert some other poetry in between reading these two books so I liked Ragged Point Road much better than this book. I really cannot explain why that is as I really have no good idea myself. This book does have several poems from the chapbook, including some that I really like. But, somehow, as a whole it does not work for me as well as Ragged Point Road did. Perhaps in a year or so I will reread them and switch the order in which I read them so as to get a different perspective. I made sure to insert some other poetry in between reading these two books so the second would have a 'little room to breathe' but it didn't seem to matter. I liked this book. Some poems were better than others. Some poems I really liked. Some I almost skimmed through. Some started to sound all the same. Some were original. I'd probably do 2.5 stars on this book. I liked "Ragged Point Road" better, but I still enjoyed this book. I am not normally a big poetry reader, so perhaps that is a little bit of my ambivelance. Love these poems. Midwest. South. Teacher. Wise. A solid book of poetry. He gave a voice to things that I see, and try to write about, in the Delta daily. Joe Wilkins was born and raised north of the Bull Mountains, out on the Big Dry of eastern Montana. His debut novel, Fall Back Down When I Die, speaks to the struggle, violence, and care Joe knew growing up in the rural West, and his memoir, The Mountain and the Fathers, captures the lives of boys and men in that desolate country, a place that shapes the people who live there and rarely lets them Joe Wilkins was born and raised north of the Bull Mountains, out on the Big Dry of eastern Montana. His debut novel, Fall Back Down When I Die, speaks to the struggle, violence, and care Joe knew growing up in the rural West, and his memoir, The Mountain and the Fathers, captures the lives of boys and men in that desolate country, a place that shapes the people who live there and rarely lets them go. Wilkins is also the author of the poetry collections Killing the Murnion Dogs and Notes from the Journey Westward. His most recent book of poetry, When We Were Birds, part of the Millers Williams Poetry Prize Series, edited by Billy Collins, won the 2017 Oregon Book Award in Poetry. His work has appeared in a host of the nation’s leading magazines and literary journals, including The Georgia Review, The Southern Review, The Missouri Review, Harvard Review, TriQuarterly, Orion, The Sun, High Country News, and Slate. As the winner of the Boyden Wilderness Writing Residency from PEN Northwest, he and his family spent the summer and fall of 2015 living in a remote cabin in the Klamath Mountains along the Rogue River in southwest Oregon.